I forgot how fun and fast knitting with chunky yarn is. 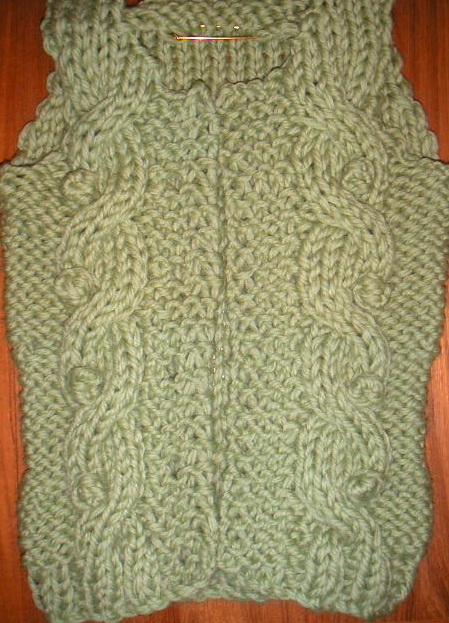 I finished the body of the Best Friend Cardigan last night. I actually had finished this two nights ago, but ripped out the first attempt because the gauge seemed off even though my swatch was right on. It turns out that I was knitting too many rows between turning the cables. The sleeves are supposed to be knit up in reverse stockinette stitch, but I may try something different, like garter stitch, instead. I really like the subtle shaping at the waist. I'll have to look for some good buttons this weekend. Have you ever realized that when you buy readymade suits you get a choice of only a few colors & styles, also finding the perfect fit are quite difficult? Wouldn’t it be better to choose from over 2000 different British & Italian fabrics and get a tailor made suit at a similar price that you pay for readymade suits? We are a company based in Hong Kong and have been providing custom made suits & shirts since 1997. With representatives in major cities around the globe we can arrange to show you the fabric samples and take your measurements, or you can also place your orders online with the help of our measuring guide. There are over 2000 fabrics to choose from along with all the latest styles. All our suits and shirts are produced by highly skilled Shanghainese tailors in Hong Kong and delivered in about 4 weeks, express delivery can be made in 2 weeks at a minor extra cost. In case you are not able to find what you are looking for then please let us know your requirement may it be in words or by a photograph and we could arrange it for you. We also have an outlet at the Hotel Intercontinental Budapest where you are most welcome to visit us. Though we are not located in streets like Savile Row (London), we have still been able to offer made to measure suits to many VIP’s from around the world. That is a gorgeous pattern. I cannot wait to see yours also. Hope it goes easy!